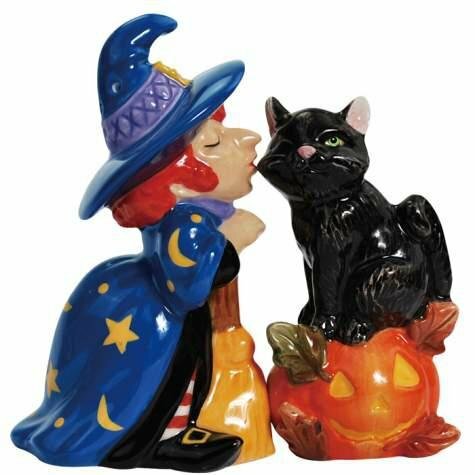 I am always looking for items that I can use in the house to decorate for Halloween and I have found a cute little item that will work in the kitchen or dining room for this year and years to come. 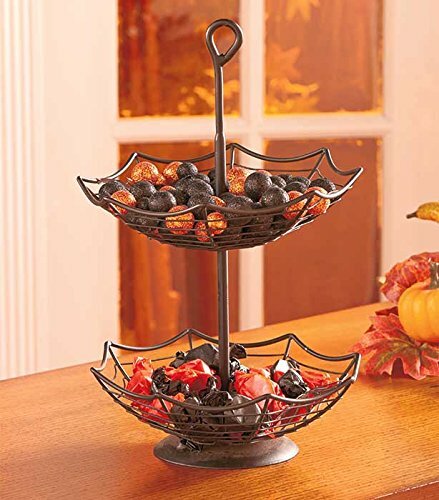 A two-tier basket that looks like a spider web is perfect for serving all kinds of small treats. This fun little piece of decor can be so useful! I can place small candies in it for people to help themselves. It would look adorable with small little gourds and pumpkins displayed for a centerpiece. The spider web basket will fit on the kitchen or dining room table, the counter or a buffet if you have one. It is even a fun idea for an office to have on the desk or perhaps in the reception area for customers or clients to enjoy. I think it would be hysterical to place a fake spider under some of the candy to scare people with but I have a bit of a sick sense of humor. This is one of those things that you might find way before you need it but that is no problem. Just store it away until it is time to get those Halloween decorations out. I think it is so cute, I may have to get two or three of them and have them sitting in different rooms. 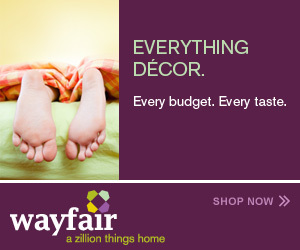 It is really going to coordinate with just about any Halloween theme in a room, that is for sure. I think it is one of those subtle little touches that can be added to the decor that kind of finishes the room. It is all in the details and this little detail just makes me smile with the possibilities of it’s functionality. Decorating for Halloween has become almost as popular as decorating for the Christmas Holiday. The table should not be forgotten when deciding on decorating items. Follow along with me as I give you some ideas for your table in your home or for that special Halloween Party you are planning. You will find Halloween Tablecloths, Halloween Table Runners, and other Halloween table linens. No matter which holiday you are decorating for, the table sets the mood. Choosing a fun and whimsical tablecloth for Halloween can be the beginning of your theme for this fun fall holiday. Once you have made your selection for the tablecloth, you can then decide what will fit nicely for your centerpiece and go from there. Depending on whether you are decorating for the entire month or just for a special Halloween party you can find a tablecloth to suit your mood. There are scary ones, creepy ones, and whimsical ones to choose from or really simple ones like the image below. If you are feeling really creative and have an artistic and crafty gene that you want to connect with you can take some ideas from this video and make something really unique for your table decoration with a cloth for the table that you created yourself. One way to decorate your Halloween table with a unique tablecloth is to purchase some really great Halloween fabric and make your own. That way you can have something that fits your personality and a tablecloth that is not found in stores. Tablecloths are easy to make, just pick the fabric and make sure it will cover your table, hem the edges and it is done. A great source for fabrics is shown below. You may decide that a tablecloth with a specific Halloween theme just is not right for the look you want. You can go with a more traditional look with a cloth, runner, or placemats that are in fall colors. Placing a lovely bouquet of flowers on top of the tablecloth will add a finished look to your table at Halloween and can continue into the rest of the fall season. Hey, that is OK, not all of us have a desire to make things ourselves. 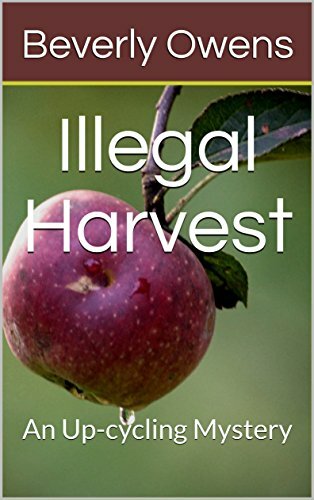 There is no crime in that. There are plenty of options of ready made Halloween tablecloths that can be purchased and put right on the table. One hint that I would give on these that you purchase from a store is that once you have taken it out of its packaging you might want to get those creases out of it. You know what I mean, I am sure, those deep creases caused from the manufacture when they placed it in the sleeve. What I do is (if it is cloth!) 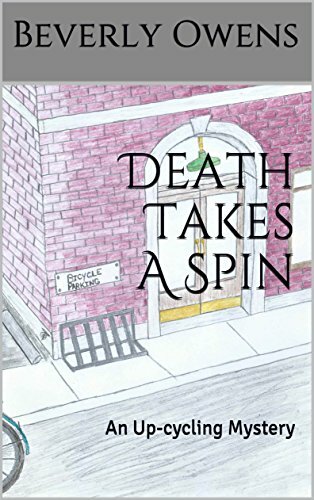 put it in my clothes dryer. I put a damp towel in with it and tumble it for about 20 minutes. The dampness from the towel helped to get the crease out. Of course you can always get the old iron out and press those creases out, too. Use this handy link to see your options at Amazon: Halloween Tablecloths. Sometimes you do not want a full tablecloth so you can also consider a table runner that will go down the center of your table. Actually, I like to use an autumn colored plain tablecloth and then top it with a festive runner. It gives the overall look more depth. Placemats are a great option for the kitchen table for the month of October. I don’t particularly like to use them for a party but they do add some fun in decorating for Halloween for every day use. 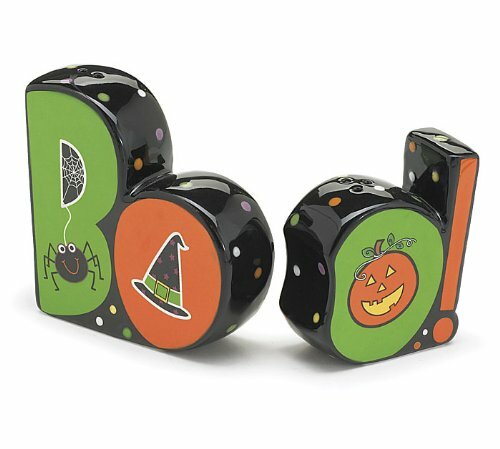 I am still looking at ideas to use to decorate the kitchen for Halloween and this week I have found salt and pepper sets with the theme that can be used during the month of October. Did you know that there ever were cute little sets to use as a part of your decorating? I didn’t until I just happened to be looking around and saw some really cute ideas. 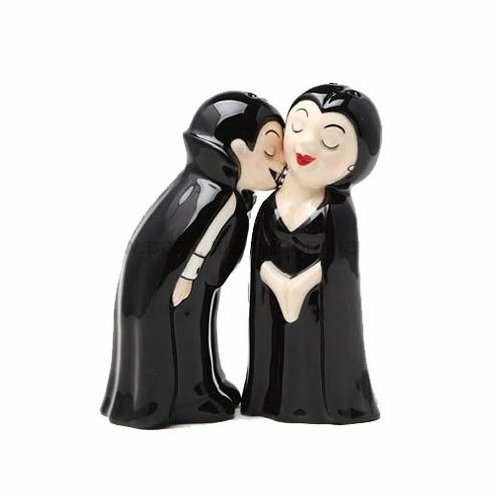 The fun thing about having one or two sets of salt and pepper shakers for any holiday decor is that they can be used to just sit on a shelf or they can be on the table ready for the family to use while you dine. Heck, some of them are so darned cute, I am tempted to sit them around in other parts of the house just as a decoration for a shelf! See what I mean? This is only my four most favorites! I am showing the Furry Bones Cats and there are several other options in the Furry Bones line that would look adorable sitting just about anywhere. They do not HAVE to have salt and pepper in them, ya know. When I was a kid and would go visit my Great-Grandparents they did not have any shakers for salt or pepper on their table. Instead there was a small sized bowl (almost a berry sized bowl) sitting on the table with salt in it. If you needed extra salt you took a small spoon and dabbled it onto your food. What I did not know then but I do know now was that it was their own version of a salt cellar. You see there have not always been shakers for salt. It is believed that John Mason (the same guy who gave us canning jars) invented a receptacle to dispense salt evenly through holes in the lid. It did not work so well in the beginning. Fifty years later, the Morton Salt company added magnesium carbonate to their salt and bing, bam, boom….the salt could pour out of a shaker. What I like about having special little sets for Halloween is that they can be cleaned and stored away after Halloween and then brought out again for years to come as a part of the overall decorating for this fun October holiday each year. It can begin to be a tradition just as we often have decorations for Christmas that we use each year. Items like these become things that the family begins to look forward to seeing again. To view even more ideas for shakers for your kitchen visit this link: Halloween S & P Sets. Halloween is such a fun time to decorate and there is no reason why we can’t decorate our kitchens along with the rest of the house. 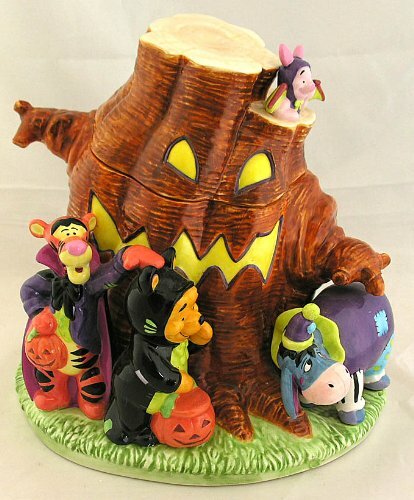 One fun way to begin the decorating is to set out a Cookie Jar that has been designed for Halloween. Filling them with cookies is optional, but why would one do that? If you do not bake your own cookies, get some at the local bakery or grocery store. 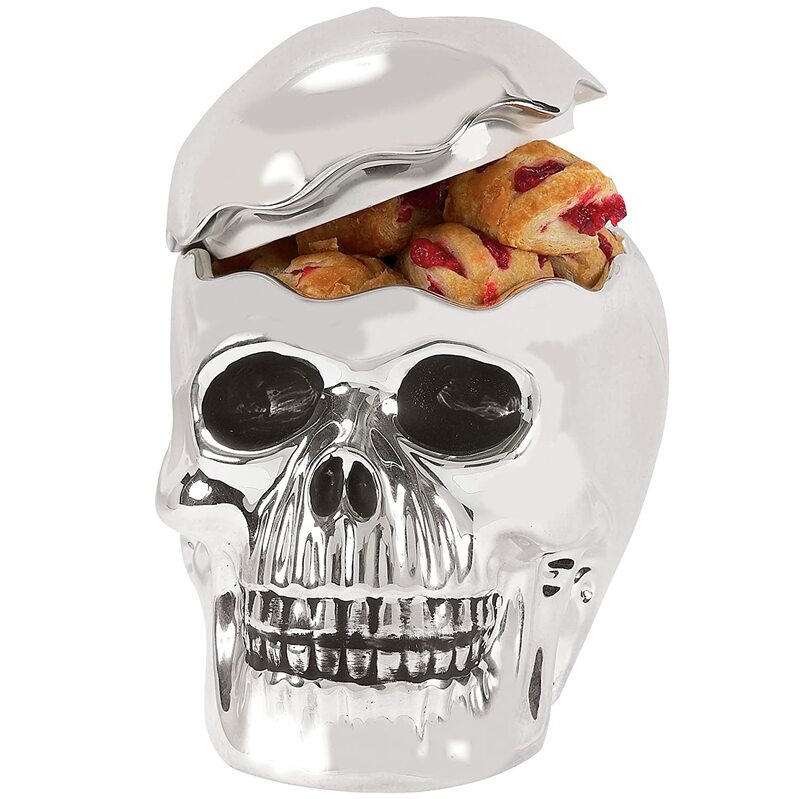 Because let’s be honest…what fun is a cookie jar with no cookies? Hmmm? I, personally am a big fan of cookies and so are my Grandkids. So, having a fun cookie jar for the different seasons of the year is a fun way to decorate and provide those sweet treats that Grandmas are known for. My kitchen does not have a Halloween one, yet; but after having done a little shopping that is a situation that is soon to be rectified. Let’s take a look at the ones that I am considering. 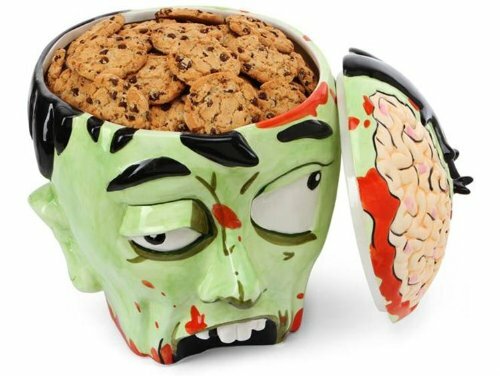 These are my top four choices and the more I look at them the more I like that Zombie head to store my cookies in. The owl with the witch hat is adorable and Winnie the Pooh and his friends dressed for Halloween are pretty cute, too. They would be perfect for a less than scary look that is for sure. The skeleton head is pretty awesome having that almost chromed look to him but the Zombie just screams (pun intended) Halloween to me. Women have been using vessels for keeping their cookies away from possible pests for a really long time but cookie jars really are not that old. Biscuit jars started to be used in the latter part of the 18th century in England but it would be the 1930s before cookie jars became popular in the United States. There were containers for women to store them in, they just were not what we think of as a cookie jar, now. The Brush Pottery Company is believed to have made the very first official ceramic cookie jar in Zanesville, Ohio. Up to that point most were glass with a metal lid. That first ceramic one was green with the word cookies embossed on the front. 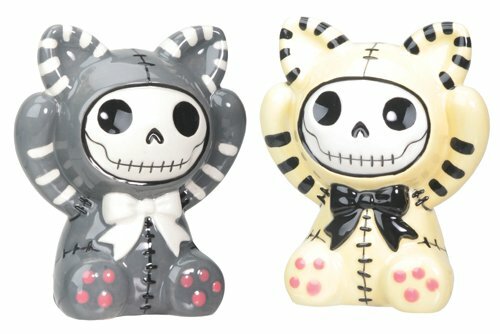 Doesn’t sound nearly as cute as these Halloween cookie jars, does it? You can store other items in these jars, if you want to. They are perfect for dog treats, candy or anything that is small. 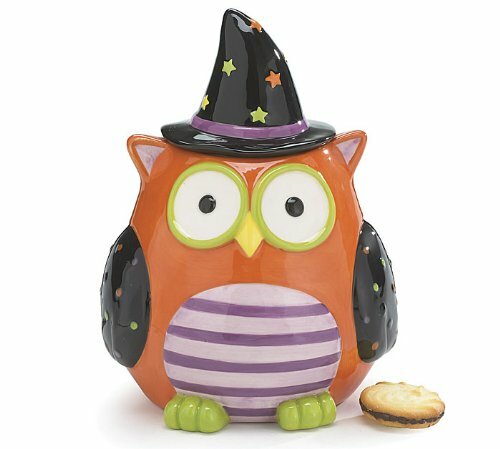 So how’s about it girls…had you considered a Halloween cookie jar as a part of your decorations this year? They are really fun aren’t they?